Kitchen full equipped, antique furniture, king size bed. This property is a 10 minute walk to restaurants and shops. The original building dates back to 1829 and the structure has remained unaltered since; the interiors have recently been restored to provide modern comforts and conveniences whilst maintaining the original rich architectural style. 'Case Maribelle' is situated in the old town centre of Montichiello, in what was once known as the 'Garden of Montichiello', close both to the town walls and the Piazza del Teatro. My family choose this property because it seems stop in the time, intact , charming. I only had internet the first couple of days, wifi-no internet. I found a man in my kitchen talking to me while I was trying to take a nap on Saturday afternoon. Seems as though he thought he had rented my place but I told them I had it for one week, maybe they should try upstairs. When I arrived I did not know where I was to stay, thought it was a certain number, but that was a garage so found someone local who knew Barbara and he tried to call her. Walked me over to an apt. and he knew where the key was and let me in, luckily, I recognized the bedroom. Also there was a small cigarette lighter to start the stove top which I could not get to work and found NO instructions for renters anywhere. I finally bought a flame thrower and could light the stove. Barbara had told me, via email, that she would bring matches over that weekend but I never saw it or her while I was there. It would be nice if she could write down some simple instructions for the guests other than to water the outside plants. It is also nice if the owner could send the correct # and some instructions to the upcoming renter since some of us come from far away. I discovered when I returned home and had taken the phone off of Airplane mode, that she had tried to call me but I did not know that and this was my fault as I never told her that my phone would not work once I departed the US. The place was extremely clean which I greatly appreciated. I send you every instruction to arrive. I many time to visited you, you never was in the house. our very nice hostess made sure we had all that we needed- this apartment is adorable and unique. be aware that after unloading your luggage- you must park in public parking down the hill. 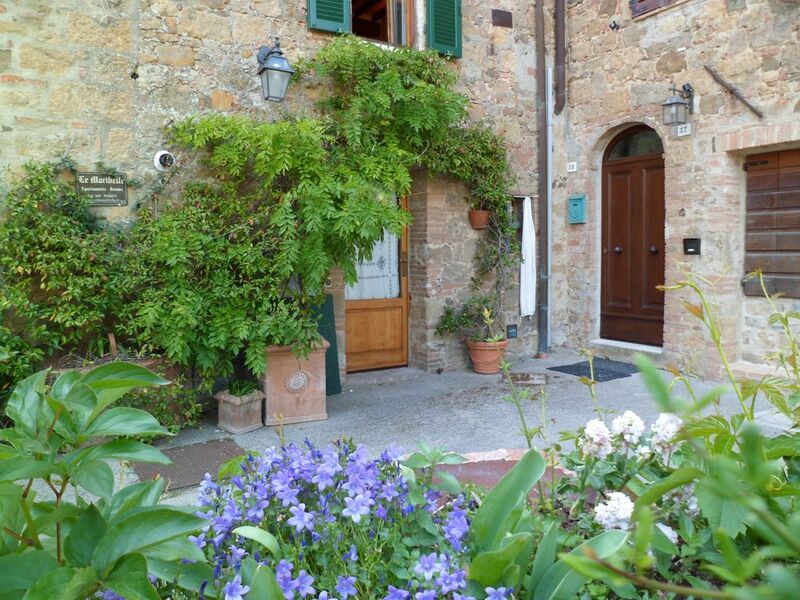 This was a wonderful home base to travel around in Tuscany from! Loved, loved, loved Monticchiello and staying there for three nights. The apartment is just what we were looking for in a Tuscan experience. ...timbered ceilings, stone walls, tile floors, a patio looking over an orchard, all in a delightful little village of less than 200 people. We were treated so well by the locals, had a lovely dinner at the Porto, and made a couple of pici dinners at 'home'. The local wine is wonderful! Thank you, Barbara! Staying at this place was a most lovely experience. The views of the Val d'Orcia from Montichiello are spectacular, while the village itself is charming, quiet, and mostly maintained in its medieval setting. We had wonderful meals at the restaurants in town (especially La Porta and La Cantina de La Porta) and enjoyed the people and atmosphere of the village. The apartment, lovingly decorated with many details that maintain the charm of a different time, seems spacious because of its private terrace which provides a beautiful spot for breakfast, reading, and evening meals. During our stay there was a local village festival going on where one could see the town's people in the production of a play and sample the cuisine prepared by the locals. Our host Barbara was a very responsive and gracious, ready to provide us with any information needed. Also the people at the close by restaurant La Porta were very nice when we arrived in a rainstorm trying to get our bearings. We hope to return very soon, maybe even next year because we loved it. Fabulous place to stay. It's cosy, and feels like home. Barbara is the perfect hostess and is so kind and helpful. It's a lovely region to be based in for visiting hill towns, and the town of Monticchiello is picturesque and very welcoming. The local La Porta restaurant served up the best meal of our entire trip to Italy. And the local information centre is great for wifi and local info. Le gîte est situé dans le charmant village médiéval de Montichiello, sur le haut d'une colline d'où l’on peut admirer les paysages exceptionnels du Val d'Orcia. Le village est piétonnier, au calme et dans la sérénité, il dispose de trois restaurants de qualité ; nous avons aimé la cuisine traditionnelle et l’ambiance de la Porta. C'est un excellent point de départ pour des randonnées à la découverte de la Toscane mais aussi de l'Ombrie voisine. Le gîte est très agréable, confortable, avec une décoration romantique ; il comporte une terrasse donnant sur une oliveraie ; le soir c’est une merveille d’assister au coucher de soleil sur Pienza assise sur le haut de la colline d’en face. Barbara est d’une grande gentillesse, nous la remercions pour son accueil. Spa are 10 minutes from the village, outlet and golf 40 minutes from the house.